Notching their best year since 2008, the nation’s biggest builders took advantage of an improving economy and a better housing market to find revenue in new places. The 2014 Housing Giants report shows the nation's largest home builders have largely recovered from the challenges of the economic downturn. But their gains hide the breadth of changes underway and the diversity of approaches required to succeed in today's markets. In the more than 40 years this publication has compiled its annual list of the nation’s largest builders—the Housing Giants—seldom, if ever, have the results over time reflected such a deep and prolonged decline in revenue and output as the one experienced by builders over the past several years. In 2008, as builders began reporting their initial descent, the largest 225 firms tallied $81.4 billion in revenue on 317,361 closings. At the bottom, in 2011, those figures shrank by nearly half to $42.3 billion on 172,750 closings. The good news: The 2014 Housing Giants report clearly shows that the downturn has been replaced by a housing market filled with new opportunities and new challenges. 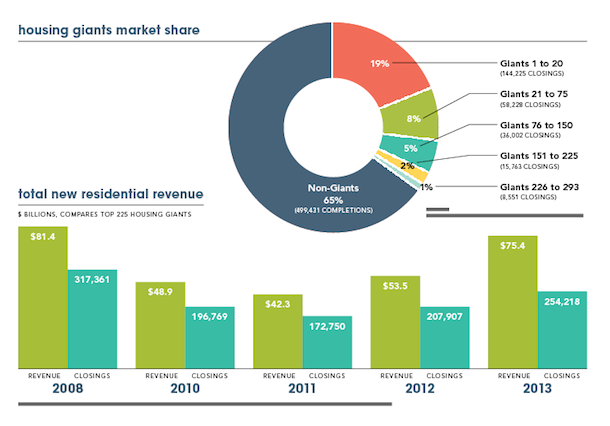 This past year, the largest 225 Housing Giants (of the 293 Giants reporting) made double-digit gains to get within earshot of levels from five years ago and banked $75.4 billion in revenue on 254,218 closings. On the face of it, their recovery seems nearly complete. But these gains hide the breadth of changes underway at the nation’s biggest building firms. The gains also obscure the diversity of approaches required by most builders to succeed today. 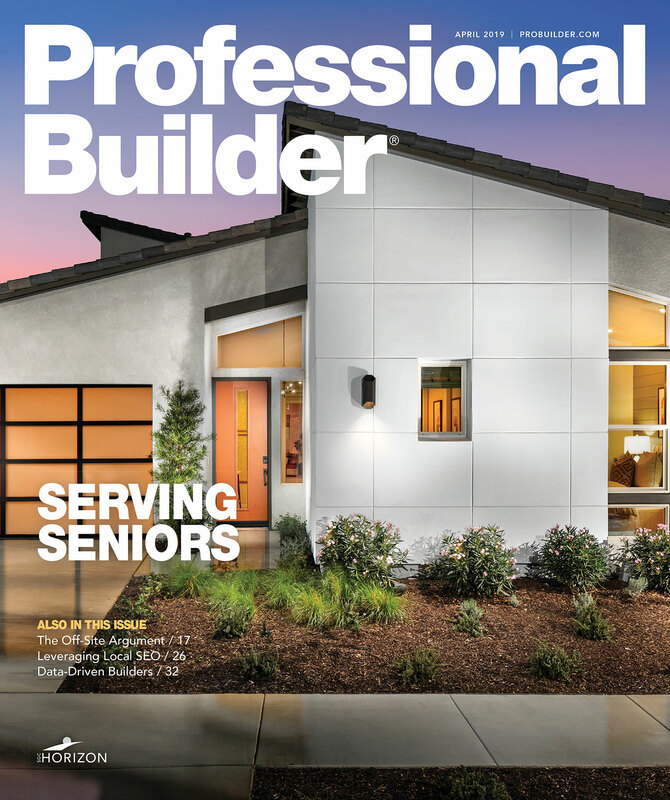 This Housing Giants report, which includes the annual rankings and a heat-map poster of the United States, as well as deeper discussions of financial and energy efficiency strides made by builders plus a profile of a builder making a comeback, demonstrates that today’s housing market is grounded in new and sometimes unfamiliar fundamentals. The new fundamentals have led big builders to add new skills and new geographies and, in general, to be more nimble and entrepreneurial. From the early 1990s until 2007, Housing Giants tended to operate within clearly defined niches—single-family starter, single-family attached, first move-up, luxury, etc. That is no longer the case today. Due to myriad factors—the availability of finished lots to the relative buying strength of some demographic cohorts over others—big builders are working with what the market is giving them, even if it happens to be very different from what they have done in the past. To achieve their gains in 2013, Housing Giants broadened their product offerings, expanded into new markets with better job growth, and exhibited an entrepreneurial flair to make it happen. This was true from the top of the list to the bottom. Once focused almost exclusively on starter homes, KB Home, No. 8 on this year’s list with $2.1 billion in revenue, now builds 22 percent first move-up and 11 percent second move-up. Likewise, Beazer Homes USA, No. 13 on the list with $1.27 billion in revenue, now builds only 50 percent starter homes, with the rest divided between first and second move-up and active adult. Ranked No. 39, DSLD, with $300 million in revenue, is expanding its product offering to reach more move-up buyers. The fundamental reason is clear: The market for starter homes is weak. Millennials are simply not entering the market for new homes in the same numbers as their parents did. 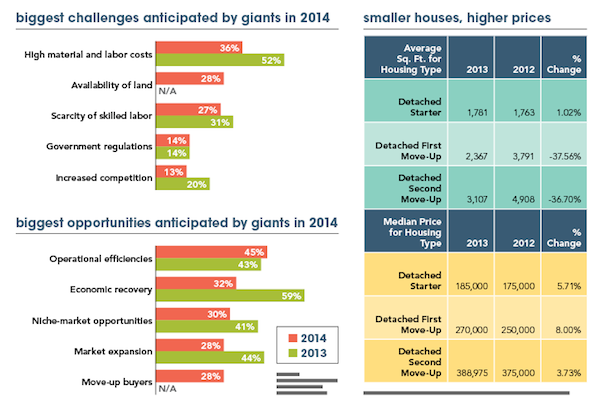 Consolidation continues to play a role as builders seek new geographies and better markets. No. 15 builder David Weekley Homes in recent years expanded into Indianapolis and Phoenix via acquisition. This is due, in part, to higher prices and higher demand for finished lots in A locations as builders stay away from riskier suburban edge communities. The No. 5 builder, Toll Brothers, which billed $2.7 billion last year, acquired Shapell Homes for $1.6 billion last year. A driving motivation for Toll in seeking that company was its 5,000-plus entitled lots in coastal regions of California. Ranked No. 47 last year, TRI Pointe Homes acquired Weyerhaeuser Real Estate, the No. 14 builder by revenue, at the very end of 2013 in a deal valued at $2.7 billion (Weyerhaeuser Real Estate includes Pardee Homes and Quadrant Homes, among others). Separately the company acquired 892 lots in California and Colorado via a flourish of fourth-quarter transactions. In 2013, the name of the game also was to actively open new communities to meet pent-up demand. Toll opened 80 communities. Shea Homes, ranked No. 16 with $1.1 billion in revenue, opened 73 new communities. This proliferation of new communities translated directly to more new designs, more new model homes, and more new design centers. Cincinnati-based Drees Homes, No. 22 on the list with $568 million in revenue, said its “single biggest change” last year was to build new models along with a new design center. Many others did the same.